When our dogs finish their breeding careers they live with us or stay in their guardian homes as pets. All of our retired dogs have full health clearances which were kept current during the time they were parents for us. None of these dogs are looking for homes. Penny is mother, grandmother, great grandmother, great, great grandmother and great, great, great (!) 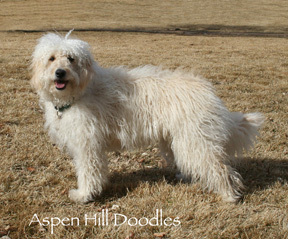 grandmother to many of the pups here at Aspen Hill Doodles. She's a Golden Retriever. 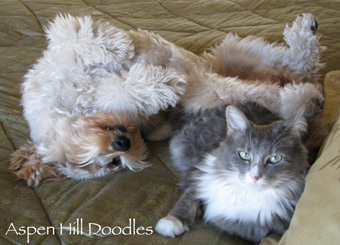 She sadly passed over the rainbow bridge, but well into her teens, she still actively participated in raising our pups. She is Luna and Gucci's mom (see below on this page). Penny is one of those dogs that never needed to be formally trained, she seemed to have been born with good manners. We just showed her what we'd like her to do, and she did it. She also acted as interpreter for some of the other animals in the house, if someone needed something (like to go out), and they didn't know how to communicate that to us, Penny told us. She was incredible! Some of her siblings were the same way. She was a super mom, and grandma and produced some wonderful puppies! She is Bindi, Maggie and Botza's grandma, Naiya's, Granby's and Rio's great grandma, and Casey Bear's and Rusty's great, great grandma. She is Mango's great, great, great grandma! You'll find these dogs below and on our PARENT DOGS page. Luna is one of Penny's (see above) puppies. She's a Golden Retriever. She loves everybody and if you're not careful, she'll try to creep up into your lap. She is happy and likes to be silly, and she's always ready to play. She really enjoys carrying things and she teaches us to pick up our socks because if we don't, she will! One time her mouth was extra full and we counted 10 socks! When she finds things around the house she carefully brings them to drop into the puppy box for the pups to explore. She is Lulu and Bindi's mom (see below), and also Maggie's mom and Naiya's grandma and Casey Bear and Rusty's great grandma, and Mango's great, great grandma (on our PARENT DOGS page). Her coat is a lustrous red that shimmers in the sunlight. She has retired to her family and is using her puppy raising skills to help raise her new human baby! Maggie is one of Luna's puppies (see above). She's a Golden Retriever. 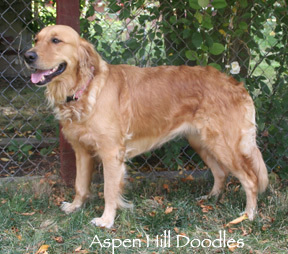 Her father is an English Golden Retriever, born in Europe who comes from completely different bloodlines than Luna. 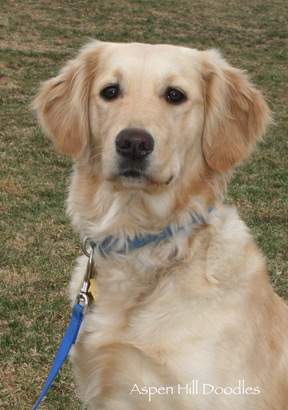 Maggie is very healthy and has the sweet, obedient temperament that is characteristic of our golden retrievers. Like Luna she loves her toys and she is gentle with them, carrying them everywhere. She lives in a loving guardian home and her favorite place to be is in the middle of the family activity, especially with her human mom. She's a beautiful girl, with a strong, blocky structure. She's happily retired with her human family. Hallie is a beautiful, sweet girl. Sunshine (see below) and Rio (on our PARENT DOGS page) are her daughters. Kaya, Kyle and Buckster are her grandpuppies, Mango is her great, grandpuppy (see our PARENT DOGS page). 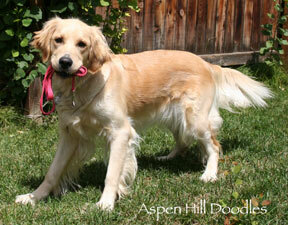 She loves to play and carry her leash as a reminder that she's available for walks! She's smart! When she picks up her leash she "stacks" it together so that there are no long dangling pieces! She's not allowed on the furniture, but early in the morning she makes her best effort to slip undetected up under the bed covers with her guardian! Her mother's bloodlines are purely American, her dad's purely European so that her lines are diverse, contributing to her robust good health. She is living out a happy retirement here in Lakewood, Colorado. 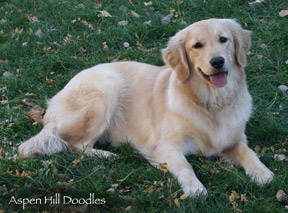 Deja is our beautiful honey gold colored Golden Retriever. She is as sweet as she looks. As far as she's concerned everyone is her friend. She loves to go camping and sleep in the tent on her own sleeping bag. She adores her squeaky toys. When she plays in the snow she rolls in it, and buries her face, and eats it! She's very curious and always keeps an eye on everyone in her guardian family. She produced some beautiful puppies with her happy spirit! Gracie (see below) is one of her pups. Sawyer is her grandson (on our PARENT DOGS page). She has retired in comfort to her guardian home. April is is always smiling, and wagging her beautiful tail. She's a Golden Retriever. She loves everyone, even the mail man! She’s calm and patient in the house, playful and energetic outside. She loves to roll in the snow, and play fetch. She walks beautifully on her leash, you almost can't feel that she's on the other end! She comes from diverse American bloodlines with a long history of good health and temperament. She's had some beautiful, smart pups! Phoebe and Allie (see below) are both her pups. Granby and Emma are both her grandpups (on our PARENT DOGS page).. She is happily retired with her family and enjoying swims in the river near her home. Allie is April's daughter (see above). 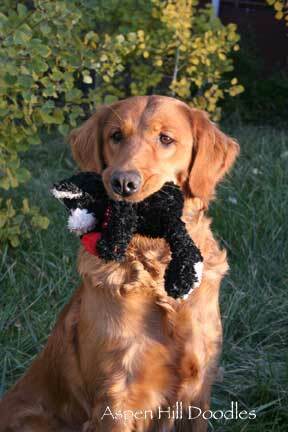 Her father is a handsome, gentle English Golden Retriever, born in Europe lending to the diversity in her bloodlines. Granby and Emma are her daughters (on our PARENT DOGS page). She knows how to get the most petting by rolling on her back and giving a silly, toothy smile. She has her mom's beautiful looks and calm demeanor. 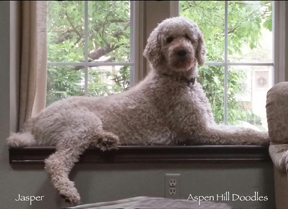 When her family is out, she patiently waits by the front window, resting her head on the windowsill as she watches them coming home. She chases the rabbits and squirrels in her garden as if playing tag, never really trying to catch them. When her favorite people come to visit, she'll wag and quietly sing a low, doggy welcome. Her guardians say she is the sweetest dog they have ever known, and just wonderful with their young daughter. She loves to play with other dogs. Her son Frankie has joined her in a happy retirement. Gucci is our Medium F1 Goldendoodle. She is the daughter of Penny (see above) and Tino (see below). You can see a photo of her when she was a pup with the rest of her litter, on our PUPPIES page. She has retired to her guardian home. She's still an energetic bundle of happiness, and a popular visitor to the dog park. She could be trusted alone in the house well before she turned a year. She loves to take long hikes with her family and cool herself in the creek on hot summer days. She's great at playing fetch and can outrun much bigger dogs! She has a soft fleece coat which is completely non-shedding. She produced some amazing puppies! She is Botza's mom. She is Rio and Granby's grandma. Lulu is Luna (see above) and Tino's daughter (Tino is below). 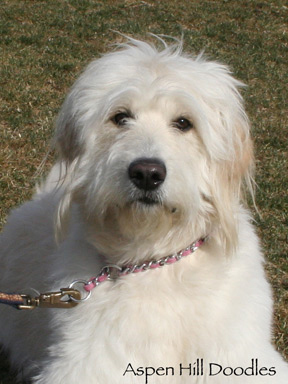 She is a Medium F1 Goldendoodle. You can see her as a pup with the other pups from her litter on our PUPPIES page. She can be playful like Luna and comical like Tino but she's mostly like her grandma Penny with an incredibly sweet, intuitive personality. She has a soft non-shedding fleece coat. She's the perfect size to snuggle on the couch or go for a walk. When she's out people stop to admire her. She loves people and her big "sister" who is a Golden Retriever. Her guardian mom retired at the same time she did and they've moved to Florida where they're enjoying the warm weather! Gracie is Deja and Cloudy's daughter (see above and below). She is Sawyer's mom (on our PARENT DOGS page). 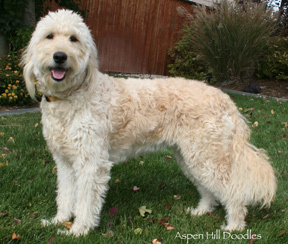 She is a Medium F1 Goldendoodle. You can see her as a pup with the other pups from her litter on our PUPPIES page. She has a lovely soft coat and is smart as a whip! She has earned her Canine Good Citizen certificate and her obedience Rally Novice title. She's also learning Agility. Like her dad, she enjoys watching TV, especially the animal shows and she's a wonderful fetcher! She gets along well with the two resident bunnies in her guardian home. Just like Deja, she is very friendly. You can also see her on our HOME page, having fun in the snow! Bindi is Luna (see above) and Strawberry's (see below) daughter. 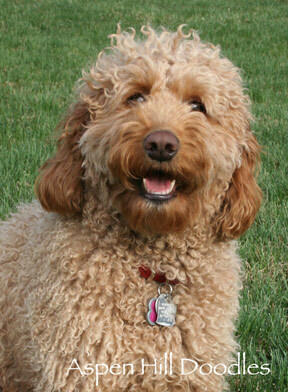 She's a Standard F1 Goldendoodle. You can see Bindi as a pup with the other pups from her litter on our PUPPIES page. She is happily living out her retirement with her guardian family. She is a sweet, active dog. She's the soccer team mascot, and has the jersey to prove it! She enjoys jogging in the foothills with her guardian high schooler, she loves people and dogs and chasing the wild rabbits that come to nibble her front lawn. She knows the rhythms of the family and goes to the front door when it's time for the kids to come home from school, and to her bed almost before her guardians realize that they're headed in that direction themselves! She is playful and happy but she knows her obedience and is very well behaved. 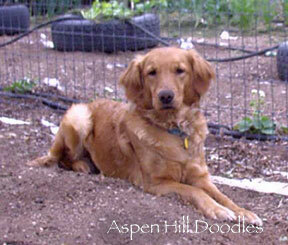 She is Naiya's mom, and Casey Bear and Rusty's grandma, and Mango's great grandma (on our PARENT DOGS page). Phoebe is April’s daughter.You can see April above. Her father is a white standard poodle. 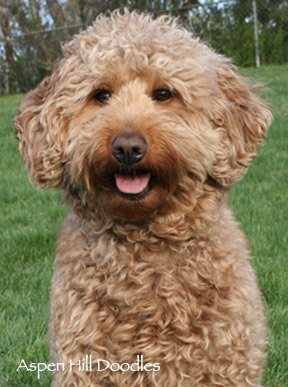 She's a Standard F1 Goldendoodle. She’s a beautiful girl with a silky soft coat. You can see her as a puppy with the other pups in her litter on our PUPPIES page. She is extremely affectionate, especially with children. She adores lying on the floor with them to read books and she loves to watch TV, especially the morning news. She is playful with other dogs and also respectful. When she’s riding in the car she'll watch for cows and horses in the pastures. She’s very clever with her paws, she lies on her back and tosses her toys in the air and catches them too! She likes to hold hands! Her pups are as sweet as she is. She has retired with her guardian who works at a vet clinic. Phoebe loves to go to work and greet the clients. Sunshine is the daughter of Hallie (see above) and a Jasper (see below). 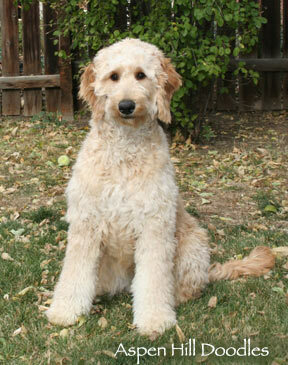 She's a Standard F1 Goldendoodle. She's a happy sweet dog. You can see a photo of her with the other pups from her litter on our PUPPIES page. She’s intelligent and well behaved. She taught herself how to carefully unzip her crate…. so she can be nearer her family! She’s athletic and although she lives in an area that is thick with desert cactus, she runs freely and has never gotten a cactus spine in her foot! She loves to play with other dogs, her doggy-day-care says she’s the best play companion they have! She has retired to a quiet life with her guardian family. She is Kaya and Kyle and Buckster's mom (on our PARENT DOGS page). Kaya is Sunshine (see above) and Milo's (see our PARENT DOGS page) daughter. She is Kyle's full sister (see Kyle on our PARENT DOGS page). She is Mango's mother. You can see her as a pup with the other pups from her litter towards the bottom of our PUPPIES page. She was very sweet and a fast learner. She was attentive when her family was talking, quickly understanding commands. She learned to heel in one session! She helped raise her new human "puppy" whom she adored. She was so gentle with him and let his mom know if he was crying in his crib, making sure that mom hurried to help him. She also loved her older dog "brother" and would bring him the ball to play, or come running if he squeaked a toy. She sometimes slept with him in his bed. She always enjoyed hiking and walks in the park. One of her favorite things was to climb into her guardian's lap, and sprawl out comfortably for a belly rub. Sadly she passed over the rainbow bridge, way too soon, after an accident. She is dearly missed. Naiya is one of Bindi's puppies, her father is Tino. You can see Bindi and Tino on this page. 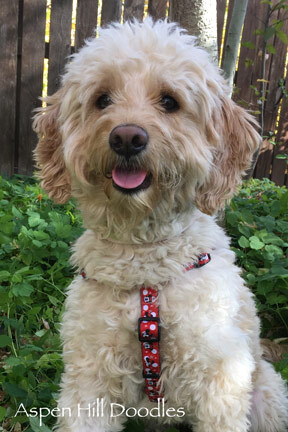 She's a Miniature F1B Goldendoodle.You can see Naiya with the rest of her litter towards the bottom of the PUPPIES page. Naiya is a delightful happy dog with her great grandma Penny's sensitive, loving nature and her dad's clownish, silly side. Her coat is as soft as chenille. She loves to let her head fall back so she can look at you upside-down, then she'll try to wriggle and wiggle up into your lap. She can run like the wind. She is quick and smart and cheerfully obedient. She gets very interested when there are animals on TV! She is Casey Bear and Rusty's mom. She is Mango's grandma. (see them on our PARENT DOGS page). She's enjoying the role of being a grandma in her retirement, helping to raise the puppies that arrive here at Aspen Hill. 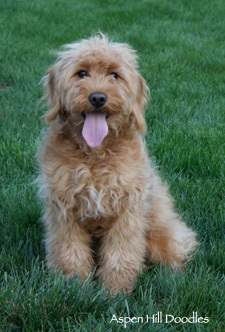 Granby is a miniature F1 Goldendoodle Retriever. Allie (see above) and Botza's (see our PARENT DOGS page) daughter. She is a smart girl! She rings the bell when she wants to go outside, and like her great-grandma Penny, she helps her dog sister by ringing the bell for her sister! Whether her sister wants to go outside or come back in, Granby rings the bell for her, from inside the house. Also, like Penny, when she's happy, especially when her family comes home, she will carry her toy, or sometimes two toys at a time, and chortle and wag and run to everyone as she excitedly shares her joy. She is willing and does not need treats to be trained. She is sweetly polite and waits to be invited up on the furniture. She's loving and cuddly and gives double arm hugs to her human dad when he holds her, putting her head on his shoulder. She likes sleeping-in, but she likes yogurt more and will get out of bed when she hears it being opened in the morning. Her favorite toy is her blue stuffed penguin. She's enjoying her retirement at home with her family in Golden. Some of our older boys are enjoying semi-retirement in their guardian homes. They will occasionally come out of semi-retirement to sire a litter for us. 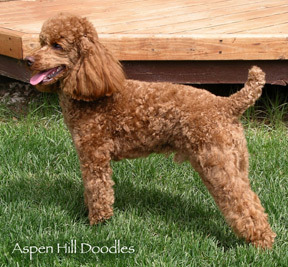 Tino is our first poodle. When he joined our family he was 8 weeks old and only weighed 3 pounds! We can't believe how much dog we've gotten in such a small package! He's acrobatic and loves to be up on the back of the couch with the cat. Nobody told him that he's little, so he plays with the big dogs and keeps them on their toes. 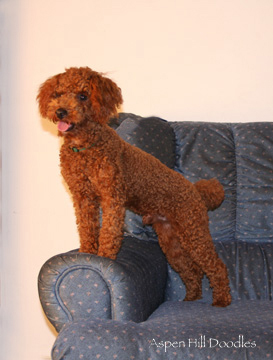 We had heard that many red poodles have health problems due to inbreeding (red is a tricky color to breed). Tino isn't inbred, you have to go back 4 generations to find another red dog in his pedigree, his genes were carried along by silver and black dogs. 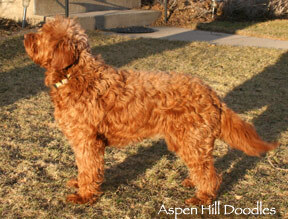 As a pup he was a lovely deep red color, he has matured to a beautiful dark apricot. His pups are light apricot/gold to a deep red and often have a white spot on their chest. He is the father of Gucci and Lulu (see above) and Naiya (see our PARENT DOGS page). He's Botza's, Casey Bear's, and Rusty's grandpa (see our PARENT DOGS page). He's Granby, Mango'sand Rio's great-grandfather (see our PARENT DOGS page). Our dogs from his line have his loyal, cheerful disposition. Milo is a star in his world. 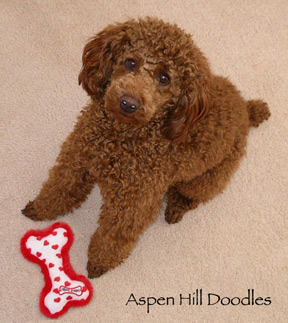 Technically he’s a Standard Poodle but he comes from Miniature Poodle bloodlines. He earned his AKC Canine Good Citizen Award and does well in Agility. He loves to fetch. Trying to retrieve snowballs is one of his favorite games. He’s very sweet and adores being held, then he lies his head down on his human mom’s chest like a sleepy baby. He is from Wales, we are excited to bring his European bloodlines into our program! Milo is Kyle's and Kaya's dad and Mango's granddad (see our PARENT DOGS page). Ximo is smart and quick. He loves to play fetch and never seems to run out of energy. He is well behaved and finished his obedience classes with ease. He's so bright that he can recognize where we are when we're riding in the car, especially when we're almost "there". He gets along well with other dogs and kids. Ximo is Botza's father (see our PARENT DOGS page). Cloudy is a comedian and a love. He is Gracie's dad and Sawyer's granddad. He likes to sleep with his head on his guardian's pillow. 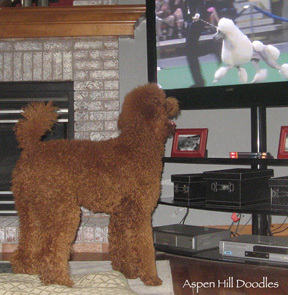 He watches TV, and when there are dogs on the screen, he'll stand up on his hind legs and "talk" to the dogs, as if he's trying to say words. When it snows he tries to catch the flakes in his front paws, like a kitten! He loves to play with empty water bottles, and can catch them as if they were balls, then he tosses them and crackles them until the crackle wears out! His playfulness is infectious. He's attentive and never misses anything. His coat is silky with soft wool curls. 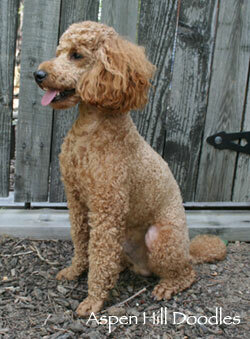 Bentley is an affectionate Standard Poodle who adores his family and his doodle brother. He's playful and looks forward to trips to the dog park where he loves to be the leader in games of chase. He runs with long, bounding, effortless strides. He loves to be held and one of his favorite resting places is outside on the hanging bed. He has a soft, curly coat. 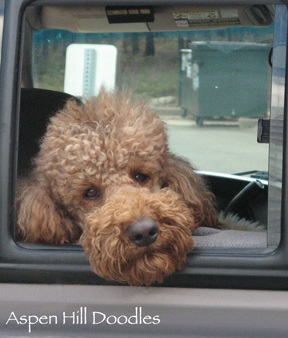 Bentley enjoys rides in the car and camping with his family and weekend trips to Starbucks. He likes to watch TV, especially shows with dogs! 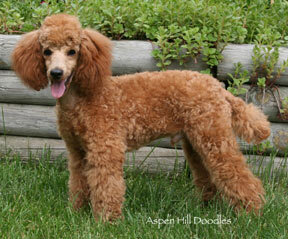 Strawberry is our beautiful apricot Standard Poodle. He has retired to his guardian home. He is Bindi's dad (see above), Naiya's grandpa, and Casey Bear and Rusty's great grandpa (see our PARENT DOGS page). He still loves to be silly and playful but even when he was a rambunctious puppy he knew enough to be gentle with the tiny kittens who share his guardian home. 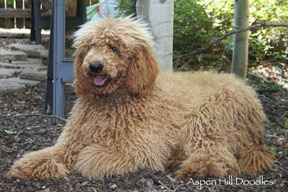 He carries the best characteristics of the standard poodle with his elegant stride, his loyal intelligence, and his affectionate personality. 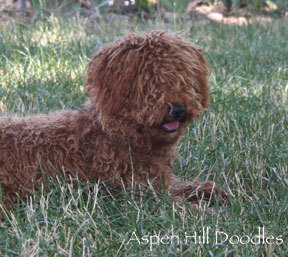 He has a soft wool coat which falls in loose curls when it's long. He has produced some beautiful litters at Aspen Hill! 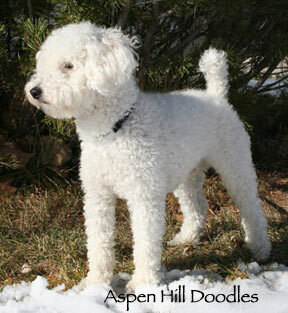 Jasper is a smart and affectionate Standart Poodle, he's a truly amazing companion. 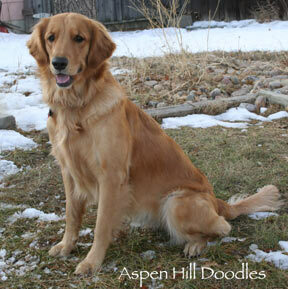 He is Sunshine's father (see above) and Kyle, Kaya and Buckster's grandfather (see our PARENT DOGS page). 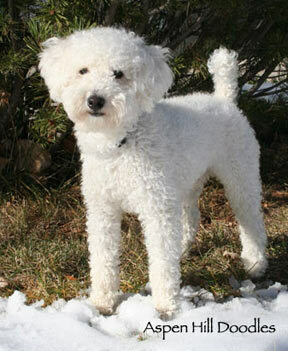 Easy-going and happy-go-lucky, he loves to do tricks for a toy or a treat. He knows more than 10 tricks in English and Sign Language! He enjoys challenges like rolling his treat ball around for hours to get a piece of kibble, even though his bowl is full of the exact same food! Also, playing "pick-one!" (where's the toy or treat?) under one of three cans, or in which hand. When he wants something, he will come stare at his owner with his head tilted to one side while she goes through a list of possibilities: "do you want a drink of water? To go night-night? To have a party? To get a bath? To play with Tyler? To go for a walk? A cookie? Some puppy chow? Your crocodile? To get a haircut?" and much more! He will bark at the right suggestion. He loves to nap in the window seat and always protects the house from the UPS man.